Fictional characters from movies, comics, manga, television programs, literature and video games are created in a simulated battle to the death. It's the clash of the modern tall tale legends. When a Texas karate master and a Sega Saturn hero fight to the death, who will be left? It's Solid Snake vs Sam Fisher in a battle for supremacy. Who will win? Marvel VS DC: It's the Merc with a Mouth against the Terminator. Whose killing skills outmatch the other? The copycat or the original? Favorite T.V. / Web shows. TV series's too watch! Or sound interesting. What is your Power Animal? A comical abridged version of "Hellsing Ultimate (2006)" with amusing parody dubbing. Jeremy, a movie goer, reviews movies and points out mistakes. A look back at how things would have been if your favorite movies had ended just a little differently. PeanutButterGamer is a Youtube-based Gamer Show, some episodes being To Kill An Avatar, The G-Files, Various Top Tens, and in November Zelda Month. In this web series the Screen Junkies crew picks out everything that is wrong with a movie and then makes an "honest trailer". No rules. No analysis. Just bloodshed. DBX puts your favorite characters in a fight to the death to see who will win. From the epic to the hilarious and even the downright bizarre. Matthew Patrick goes from Game Theories to theories about the art of film and television storytelling and industry concepts. A foul-mouthed nerd reviews bad video games. Matthew Patrick delves into common questions about video game stories and tropes and develops theories to explain them. The ongoing adventures of JonTron, as he takes it upon himself to review games of all kinds (and some movies), under the watchful eye of his friend and overlord, the cyborg bird, Jacques. The Joker has escaped from Arkham and Batman must once again bring him in - once and for all. Unfortunately for the bat, there is something even more sinister than the Joker waiting in the alley for the dark knight detective..
Boomstick: He's Wiz and I'm Boomstick. Wizard: And it's our job to analyze their weapons, armor, and skills to find out who would win a death battle. If cavemen and astronauts got into a fight. Who would win? Okay, the opening was a Joss Whedon reference but this show basically operates on that very principle. All the nerd discussions about who would win in a fight is basically what this show is in a nutshell. Each episode has 2 characters who are relatively equally matched such as The Master Chief from Halo and The Doom Guy. They analyze weapons, armour, skills from a relatively unbiased angle and animate them fighting until one is left standing. I will say watch the later ones first because the earliest ones like Harry Potter Vs Luke Skywalker has a health bar like Mortal Kombat, it just takes away some of the fun for me. Oh and I'll also suggest only watching the ones if you know at least one of the characters that are in the fight. To me the worst episode is Ragna Vs Sol Badguy because I have absolutely no idea who they are, I've never heard of what they're in and while the jokes at the beginning when they're analyzing what they can do is funny and the animation is pretty good for a low budget web series I'm not invested in any of it because each fight starts with the thought process of "Here's a reason for them to fight. Now they'll duke it out!". 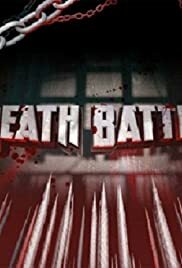 So if you're one of those people that's curious about fictional characters fighting to the death, this is worth a look.